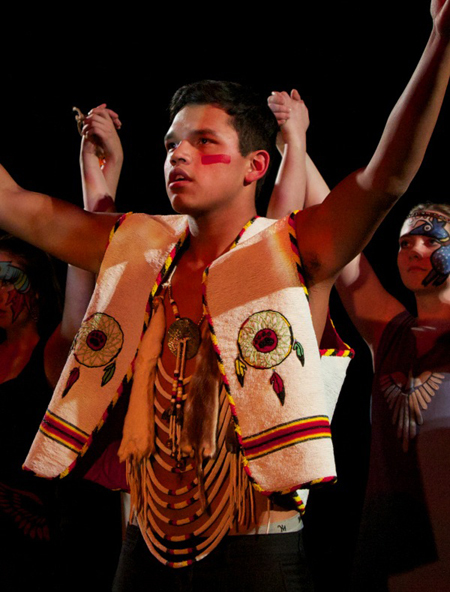 Sound, staging and heartfelt acting brought together a hauntingly compelling story of the Indian residential school experience in this year’s Strathmore High School drama production. Directed by drama and dance teacher Deanne Bertsch, with input from Blackfoot liaison and teacher Eulailia Running Rabbit, the show was an intense and powerful interpretation of Canada’s dark history in relation to Aboriginal people. Through contemporary and Blackfoot dance, dynamic music, and traditional Blackfoot drumming, the narrative piece brought together the Drama, Glee and Blackfoot classes to present the IRS experience of Siksika Nation’s own Chief Vincent Yellow Old Woman. Grade 12 student, and grandson to the Chief, Hayden Yellow Old Woman played Young Vincent and was proud to have the opportunity to tell his grandfather’s story. “It made some people think, like myself, (about) how can a young struggling Native boy grow up and become a leader of our nation? It just shows that people can be successful no matter what,” said Yellow Old Woman. The show opened with a poem written by Chief Yellow Old Woman titled ‘The Indian In Me,’ and led into a 90-minute production full of emotional and satisfying acting that resonated with the audience, as the painful portrayals of cultural dispossession was revealed. The show was stark as it demonstrated young Vincent’s culture change from having to trade in traditional clothing for more contemporary garb, to the resistance of the Catholic priest, and to the confrontation with alcoholism. The story ended with Vincent allowing himself to reconnect with his traditional ways and true identity. 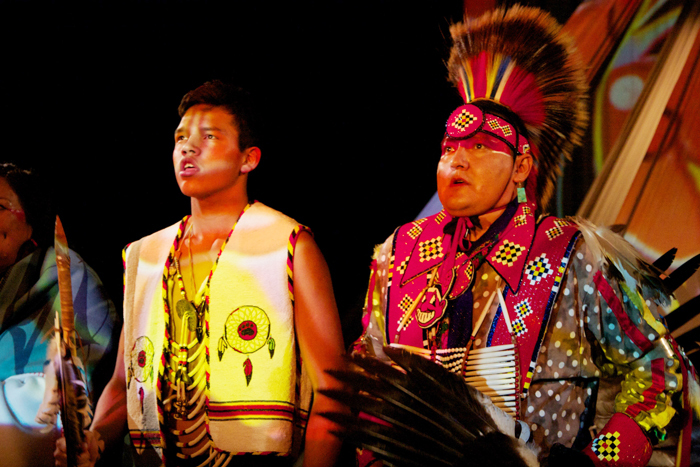 With a backdrop displaying the artwork of George Little Child and the Glee class performing songs inspired by Peter Gabriel, the narrators infused the words of the Chief Dan George poem ‘Words To A Grandchild’ throughout the production. For parent Joni Breaker, it was difficult watching her 15-year-old son Chase “live” the experience. “As a parent and watching the scene of the priest walking amongst the students and my son, even though he was playing a character, I couldn’t help but feel protective and wanting to tell him to leave them all alone! It was kind of hard to watch because I’m a sensitive and protective mother,” she said. Chase said the production taught him about the assimilation of his people and the loss of about 70 per cent of the traditional language. Bertsch’s own experiences and interest in the Writing-On-Stone Provincial Park contributed to the overall idea of the production. New Blood was also presented at the Siksika Nation High School and at the Kaleidoscope Theatre in Drumheller in mid-January. Photo caption: The residential school experience of Siksika Nation Chief Vincent Yellow Old Woman resonated with drama students and play-goers alike.